3/27/19 @ 4:15 p.m. - The Nassau County Extension's 4-H Program, along with 4-H Programs from around the State, organize annual camping trips to the beautiful Camp Cherry Lake where children can enjoy a variety of activities including kayaking, swimming, and fishing while making life long friends. Child Development Experts agree that summer camp also fulfills a basic need for belonging, acceptance, and humility while boosting self-esteem. Many parents desire to provide their children with the opportunity to attend summer camp, however some can't afford it. 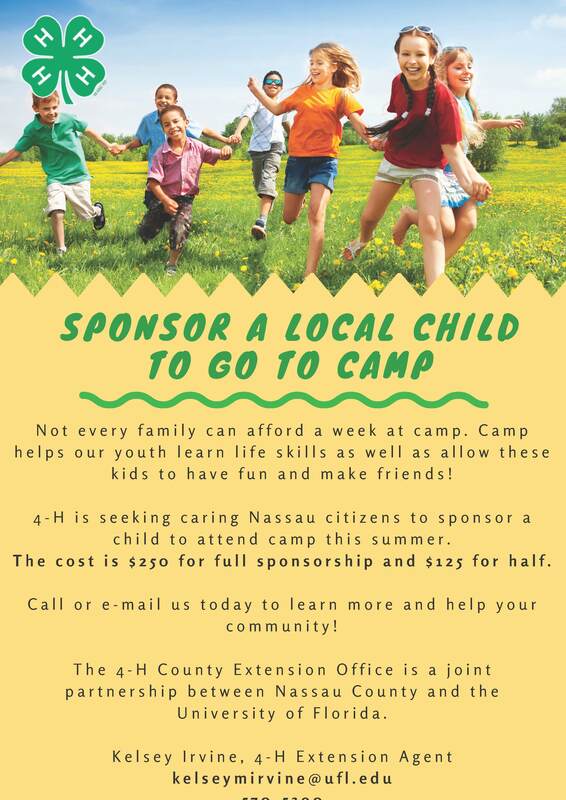 Nassau County Extension 4-H has established a program in which citizens can sponsor a local child to participate in their year's trip to Camp Cherry Lake which will take place in July. The cost is $250 for a full scholarship or $125 for a half scholarship. If you are interested in sending a deserving child to camp, please see the attached flyer or contact Nassau County 4-H Extension Agent, Kelsey Irvine, at (904) 530-6350 or via e-mail at kelseymirvine@ufl.edu. The deadline to sponsor is June 1, 2019. 2/28/19 @ 11:30 a.m. - On Wednesday, March 6, 2019, Master Gardener Candace Bridgewater will conduct a class on attracting bluebirds to your landscape. The class will include a short history of the bluebird, information on the two enemies of nesting birds, how to best protect the bluebird, the ideal habitat, and best plant and food sources for bluebirds. The class is free, however you may purchase a bluebird house to take home for $20. Please bring cash or a check made payable to the University of Florida. When: Wednesday, March 6th 10:00-11:00 a.m. If you have any questions, please contact the Nassau County Extension Office at (904) 530-6353. 12/20/18 @ 8:45 a.m. - The next segment of the Affordable Housing Advisory Committee's Housing Speaker Series titled "Myths & Truths About Repairing Your Credit" will take place on Wednesday, January 9th at 6:00 p.m. Information on your credit report has a direct affect on your ability to obtain housing. Meg McAlpine, Family & Consumer Sciences Agent for the Nassau County Extension Office, will be there to explain what factors drag your credit score down and what you can begin doing today to correct it. WHEN: Wednesday, January 9, 2019 AT 6:00 p.m.
WHERE: Callahan County Building, 45401 Mickler St. This event is free and open to the public. For more information, please contact the Department of Planning & Economic Opportunity at (904) 530-6300. Note: The County Extension Office is made up of agents, staff and volunteers that address real-life issues faced by Floridians of all ages. They can provide you with the latest information and advice on a variety of topics including obesity, chronic disease, food, finances, family stresses, housing, nutrition and more. Services are free to Nassau County residents. If you are interested in obtaining help in any of these areas, please call the County Extension Office at (904) 530-6353. On December 6th, Youth Leadership Nassau celebrated regional recognition when it received the Northeast Florida Regional Council’s 2018 Excellence in Education award. Youth Leadership Nassau (YLN) was founded as a project of the Leadership Nassau program and is currently run by Nassau County 4-H. It is a collaboration of hard work by numerous local entities and individuals including the school board, local businesses, and many community organizations. The YLN Steering Committee would like to thank everyone who has assisted with the program as guest speakers, volunteers, hosts of educational tours, mentors, or in numerous other roles to help our youth succeed over the last 15 years. This award demonstrates recognition of a truly community-driven program! YLN gives high school students from Nassau County the opportunity to meet fellow students, gain increased awareness of community needs, and develop leadership skills. Youth participate in monthly sessions on a variety of topics which include experiential learning, interactions with community leaders, and leadership development lessons. Session topics include Environmental Awareness, Government, and Entrepreneurship. Throughout the course of the program, youth create and implement group projects focused on solving a present-day issue affecting the community. Since its establishment in 2007, over 250 youth have graduated from the YLN program. Based on short-term evaluations, YLN develops leadership and other life skills (including communication and cooperation); promotes knowledge gain concerning local government, businesses, and community organizations; and provides networking opportunities for students. By supplementing traditional classroom education for these youth, YLN enhances their leadership qualities and prepares them to be future leaders in our community. For more information about YLN or Nassau County 4-H, call 904-530-6353. The sale will feature a variety of plants, fall flowers, custom painted pots and secondhand gardening equipment. All proceeds will benefit the Master Gardener Program and their community projects throughout the County. If you love gardening, you don't want to miss this event! If you have any questions, please contact the County Extension Office at (904) 530-6353. 7/23/18 @ 9:40 a.m. - The Nassau County Extension Office will be hosing a pond workshop tomorrow from 6:30-8:30 p.m. at their office located at 543350 US Highway 1, Callahan, FL 32011. Topics of discussion include pond water quality, fish species selection, aquatic weeds, and more. The cost is $10 and you can register by calling (904) 530-6563 or by clicking here.